Richie Vernon pauses for a beat or two, nodding almost imperceptibly as he considers how best to tackle a question laden with pitfalls. In the era of cheap soundbites and blaring 'click-bait' headlines, his response could so easily be portrayed as arrogance or cockiness, disrespect or flippancy. Are he and his Glasgow Warriors colleagues the Pro12's finest assortment of players? "I think we probably do have the best squad," the 27-year-old replies after a pensive frown. "Even at the moment, we've got a lot of injuries, but we don't lose a lot of strength in our starting line-up. That's a big reason for the success we've had so far this year. "You have to play well to be involved because we've got so much strength in depth." An array of tears, tweaks and strains has deprived head coach Gregor Townsend of four of his most prized backs for the business-end of the league campaign, with Alex Dunbar, Mark Bennett, Sean Maitland and DTH van der Merwe keeping the medical staff occupied. Vernon's imposing 6ft 5in, 100kg-plus frame has helped plug the hole left by Dunbar and Bennett in the midfield as his impressive transition from international back-row to refined outside centre gathers pace. "It's been great having that run," he explains. "Did I expect to be here? I certainly hoped I would be, but I wouldn't have said I expected to. "All of us that have played 13 this season bring something a little bit different to the table. "It is a different mindset, but that physicality I've naturally brought from my forward play is something I could use straight away." Vernon's journey began, somewhat conspicuously, in late 2013. After a two-year stint with Sale Sharks, he returned to Glasgow citing "unfinished business" - namely, adding to his 20 Scotland caps. "I turned up one day at Scotstoun like any normal day," he begins. "Gregor asked for a meeting after training. "Scott Johnson [then-Scotland head coach, and current director of rugby] was there and they said I had a great chance to transfer my skills to centre, Scotland-wise looking towards the World Cup. "At the time they didn't have the depth at centre they do now. "I was going to have the backing of the coaching staff to do something that someone hasn't really done before; something that really excited me. "I went home, spoke to my mum and dad, spoke to my agent, and the next day I was in the backs meeting rather than the forwards. It was as quick as that." Few doubted Vernon had the qualities groomed on the Sevens World Series to carve out a career in midfield. Brawn was no issue either - Vernon recently gained the notable distinction of being crowned the Warriors' chin-up champion, hauling a total of 174kg off the deck to break a record set long ago by retired powerhouse Rob Dewey. Indeed, the less initiated onlookers may even suppose that trading breakdown brawls for the wider expanses ought to provide welcome relief. But consider the cerebral treasure trove of scything angles, running lines and intricate moves, the positional awareness, distribution and defensive savvy that are the outside centre's bread and butter. It is here that Townsend's meticulous influence reveals itself. "Defensively, phase play looked after itself because I was used to playing outside 10 and being in those positions as a quicker forward," adds Vernon. "The big thing was around the set-piece, and defending backs plays, defending in a bit more space. There was a lot of work on decision-making; 13 has to be ready for different options. "There was a lot of agility work at the start. As a forward, you've got to deal with less changes of direction, and a lot less nippy runners taking you on one-on-one. "Attacking, it was looking up more, looking at space, when to pass, working on my longer passing. It took a lot of work but it was polishing rather than changing the way I play." Though he tempers his ambitions with great diplomacy, Vernon's quest for selection in Vern Cotter's World Cup squad is very much apparent. So too his search for a career outside the sport, tackling a degree in business economics alongside a smattering of team-mates. "It's probably just finding the same challenging, enjoyable career," he says. "Maybe not an easy adaptation from rugby, because nothing in life is going to be similar to what we experience in rugby. "I'm definitely getting towards that stage now where I want to get as prepared as I possibly can be. It gives you that focus, you realise how lucky you are and how finite your rugby career is. "Though we've got an exam five days after the Pro12 final!" 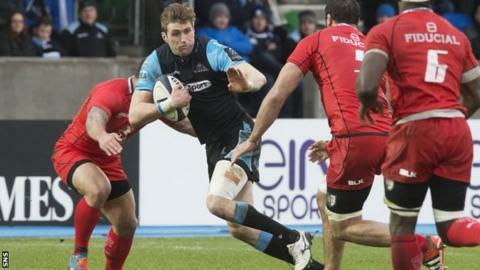 For Glasgow to make it to a second final in a row, besting Ulster on Saturday before a sold-out and expectant Scotstoun would be a fine place to start as they hunt for home advantage in the semi-finals. "I think we'd be disrespecting Ulster to say we were going to go out and try and score tries from the start," says Vernon. "Within the way that we play, we do produce opportunities - I'm sure in the game, we can produce four opportunities, it's whether we take them or not. "We want to put a marker down, no matter what the results are, have confidence in the way we play, and peak for that semi-final."